Ever since I was little I have always loved sea life. My family always lived no more than an hour or so away from the Pacific Ocean. All over California and Washington we were always close to the beach. There is something about the Pacific Ocean that is magical in a way that invigorates you and makes you curious about what is beneath the waters surface. I have never been scuba diving but I have been as close to sea creatures as I could be without getting in the water! 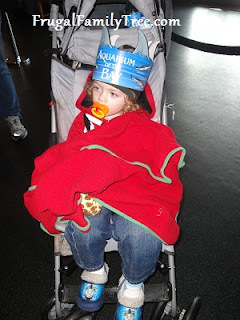 A few weeks ago my family and I went to San Francisco to visit Pier 39 and the Aquarium of the Bay. 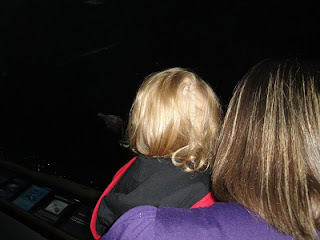 I have been to this Aquarium several times over the last decade but this was the first time taking my son and mother in law. 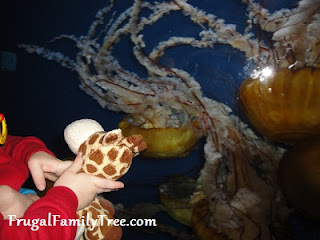 My son adores animals and I thought expose to sea animals would be great for him. When we first arrived we had the opportunity to donate some non perishable foods to a local food bank in San Francisco. We happily donated canned foods and toddler puffs. 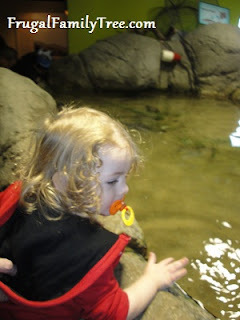 After we went into the Aquarium the fist things we saw were amazing. 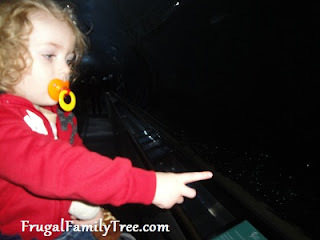 The Jellyfish displays were soothing to watch. They looked like they were slow dancing to music. My sons first thought was just as the rest of us. He said "Oh Wow!" He said "Oh Wow" many many times during this tour. Next we got onto an elevator to go down to 300 feet of crystal clear tunnels featuring over 20,000 marine animals from San Francisco Bay and nearby waters. It is always amazing to go through the tunnels. You get an underwater peek at what it would be like to go into the ocean waters. We saw many amazing creatures. There are many different types of fish Shovelnose Guitarfish, White Sturgeon, Sea Bass and lots of colorful Sea Stars. 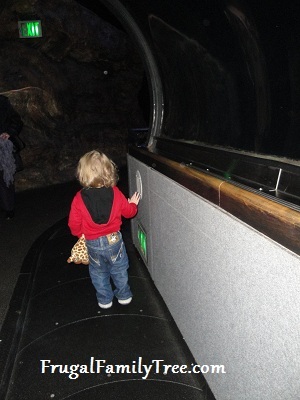 The second tunnel is filled with other sea life that is in deeper waters. 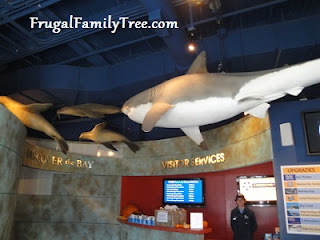 As you walk through you realize there are sharks and bat rays gliding above you. Its a very amazing experience. My son was wide eyed and in awe as we slowly rode by on the people mover. It was a nice feature to the tunnel. It kept my son moving along without him wanting to run off. They also had really neat aquariums that you could go under and put your head in a bubble as if you were sticking your head in there. It was so cool and a great photo opportunity. After leaving the tunnel area we went back up the elevator to another floor where we entered the Touch the Bay area where we began a very interactive and exciting experience. There are pools that have baby bat rays and leopard sharks, little ones of course! It was amazing to be able to touch the animals as they swam by. There was another pool with invertebrates. We were able to touch sea stars, sea cucumbers, anenomes and more. My son was very curious about touching all of them. 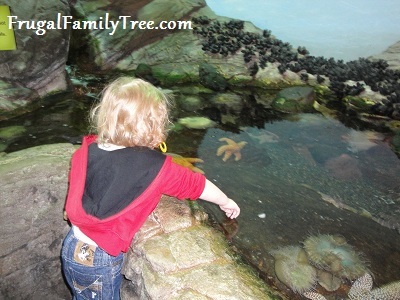 He touched a sea star and told me "Ouch". After that he would not touch the other creatures. I told him they were soft and pet them like a kitty cat but he did not believe me. A very sweet Aquarium employee even brought over a sea cucumber for my son to touch be he told her "No". She laughed a bit with me and I was thankfully she tried. The area also had interactive coloring and learning area in the room. We had a wonderful and memorable time at the Aquarium of the Bay in San Francisco. I recommend taking your family there for a short road trip if you live in the Sacramento Valley and surrounding areas. In this area we are considered locals and get great discounts. While at Pier 39 we also had to visit one of our favorite animals, the Sea Lions. They bark and play on the docks and in the water. We have visited them many many times in the past. They are always a joy to watch. Oddly this time it was the very first time we only spotted one Sea Lion. I told my son that one stayed here to help him celebrate his birthday. He then called it a dog. He makes me laugh!